At Children’s Hospital & Medical Center, we don’t want your focus on your child’s health to include worrying about medical bills. We will do everything we can to make the billing process as simple and stress-free as possible. If you want to pay your bill using a credit or debit card and without accessing Children’s Connect, use our Online Bill Portal. Send a check or money order to Children’s lockbox. What If I Can’t Pay My Medical Bill? Children’s and its patient advocates can work with you to identify payment options that meet your personal needs and ability to pay. Our patient advocates can also assist you in identifying and applying for federal, state, local, and private programs that may help cover some or all of your child’s medical expenses. To contact the patient advocates at Children’s, call 402-955-6051 or toll-free at 1-866-535-3412. Patient advocates are available Monday through Friday from 8 a.m. to 5 p.m.
What Do These Billing And Insurance Terms Mean? The amount of money your insurance company pays for the care your child receives. This is a fancy word for a bill. It’s sent to your child’s insurance company, listing out all of the services your child received. Some insurance plans cover a percentage of the costs of your child’s care. For instance, if your plan has 10% coinsurance, for an appointment that cost $100, your insurance will pay $90 and you’ll pay $10. You’ll have to pay this. Some insurance plans cover certain types of care at a set rate, called a copay. For example, your plan might charge $15 per doctor visit or $25 for each day your child is an inpatient in the hospital. The amount you must pay for medical services before your insurance company’s coverage kicks in. For example, if your child’s care costs $5,000 and your plan’s deductible is $3,000, once you’ve paid that $3,000, your insurance company will pay all or part of the remaining $2,000 (depending on what type of coverage your plan has). Most insurance plans have to cover some services (like checkups) regardless of whether you have met your deductible already or not. Is My Insurance Being Billed? Children’s bills your health insurance company based on the information you have provided about your coverage. If you owe a balance, we will send you a statement once your insurance company has processed the bill, also called a claim. If your insurance coverage changes, please be sure to tell your child’s healthcare provider as soon as possible. If you can, try to contact your health insurance provider before your child’s visit and during the hospital stay to tell them about any planned treatments, visits and procedures. Ask them if they are covered before your child gets the services. Before any major procedures, such as surgery, ask your child’s medical team if there will be anyone providing services through an independent contractor, who is not employed at the hospital. Sometimes, independent contractors are not covered under your health insurance. How Much Did My Insurance Pay? Your insurance should send you an explanation of your healthcare benefits (EOB). This will show you the total charges, payments, and any copayment or deductible amounts. If you have questions about your EOB and what your insurance company paid or denied, please call the Customer Service representatives at your insurance company. EOBs tend to have lots of numbers on them — but they are not bills. Look for the words “this is not a bill” (or something similar) printed near the top of the page to determine if you are looking at an EOB. If you need help figuring out the details on your EOB, please call Children’s Central Billing Office at 402-955-5421 or toll-free at 866-535-3412. Contact us Monday through Friday from 8 a.m. to 5 p.m.
Once your child has received medical care, the cost of these services are added up and sent to your insurance company. The insurance company then determines how much of the costs they will pay based on your plan’s coverage. Sometimes, they’ll cover all of the costs. Other times, they won’t cover everything. It all depends on the type of insurance you have. After they let us know what they will cover, any remaining costs will be billed to you. If you need help with your bill, please call our Central Billing Office at 402-955-5421 or toll-free at 866-535-3412. We are available Monday through Friday from 8 a.m. to 5 p.m. In addition to receiving paper bills, you can also view and pay your bills online through the patient portal, Children’s Connect. Why Am I Getting More Than One Bill? When your child receives care at a hospital, many different healthcare providers are involved. For services provided by Children’s employed providers or hospital staff — such as nurses, lab technicians, and physical therapists — you’ll get a bill from the hospital. Some other healthcare providers may not be employed by Children’s. They’ll send you their own bill separately for their services. These bills may or may not have the Children’s logo on them. If you have questions about any of the bills you receive, a good place to start is by calling the phone number listed on that particular bill. Some bills may have several EOBs — and some EOBs cover several bills. Keep track of these bills and EOBs in a folder. 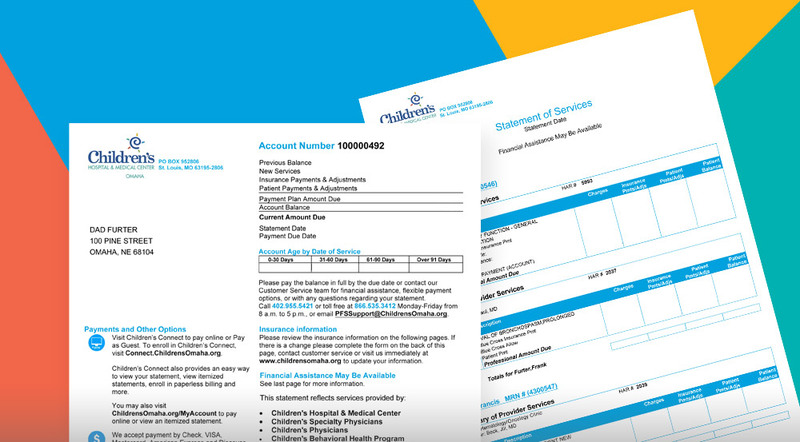 Group these documents together by the date of service (such as the day of your child’s surgery) — rather than the day the bill is received or due. That can make it a lot easier if you have to call and ask questions. Once you’ve paid a bill, make a copy of the check or credit card receipt for your records as well. If you’re given a confirmation number, keep track of it. Other Questions About Your Bill or Need An Itemized Statement? Representative are available at 402-955-5421 or 866-535-3412, Monday through Friday from 8 a.m. to 5 p.m. If you’d like to request an itemized statement from Children’s Hospital & Medical Center, please complete this online form. If you want to request an itemized statement from a Physician, you will need to call the phone number listed on your statement. What Is A Medical Record And What Does It Contain? Who Can Access My Child’s Medical Record? If your child lives in Nebraska and is under age 19, parent(s)/legal guardian(s) can access the medical records. If your child lives in Iowa and is under age 18, parent(s)/legal guardian(s) can access the medical records. How Do I Access My Child’s Medical Records Via Children’s Connect? You can access your child’s medical records through the Children’s Connect health portal. Requests to get access through Children’s Connect may take a couple of days to process. After signing up, once you are an authorized user, you can access and download your child’s medical records at any time. How Do I Request My Child’s Medical Records In Person Or By Mail? To access your child’s medical records, you will need to fill out a Request for Health Information (Medical Records) Form. Children’s Health Information Department is open Monday through Friday from 8 a.m. to 5 p.m.
Once we receive your request form, we will mail your child’s medical records. This process can take around 10 to 14 days. Representatives are available Monday through Friday, 8 a.m. to 5 p.m.